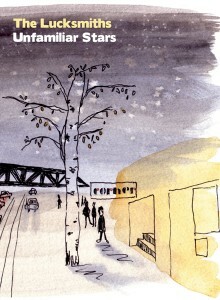 Filmed at The Lucksmiths' August 2009 farewell show at Melbourne's Corner Hotel, ‘Unfamiliar Stars’ is both a captivating concert film and a definitive end-of-the-line document, standing tall among the best of the band's vast discography. Directed by Natalie van den Dungen (The Tote documentary), the film captures the final bittersweet airings of many Lucksmiths favorites as witnessed by a full-house of hometown fans, friends and family. Clocking in at a total of thirty-three songs, the swansong performance is the culmination of farewell tours across Europe and Australia, and finds the band in vintage form, cherry-picking pop gem after pop gem from their sixteen-year career and filling the gaps with a double-dose of irrepressible Lucksmiths repartee. Rounding out the package, ‘Darkening Doorways’ is a short documentary of the band's final months and presents an intimate view of The Lucksmiths in rehearsal, in the recording studio and throughout their farewell tour. Please note: this DVD is an all-regions disc in NTSC format. Our chums at the Lost And Lonesome Recording Company in Australia have pressed the DVD in PAL format, so please point your browser Lost and Lonesome-wards if your country uses PAL.